There are so many reasons to love the green pear. Pears are packed with health benefits - they are an excellent source of dietary fiber and Vitamin C in particular, and at the same time low on calories. Although the season for pears runs from August through October, there is a variety of pear available year-round because of the seasonal variations amongst the different varieties .And Coconuts are one of the most nutritious of all fruits. It is easy to make and less expensive as it does not require much of ghee. yesterday my daughter brought some pears it was too hard and bit sour instead of wasting it I decided to make it sweet. I have prepared this sweet before once.. 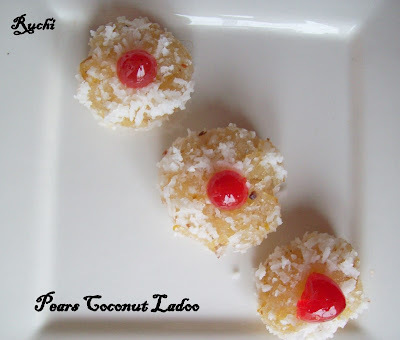 It is lovely and sweet with Pear ,beautiful coconut and cardamom flavors .In home Each and every one said 'Wow'! 1.Peel off all the pears. 2.Take water in a pot and add some pinch of salt to it. 3.Then put all the pears in this water for 10 mints. 4.Then grate them all and remove the extra water by squeezing the grated pears. 6.Then add the grated coconut to the boiling sugar syrup and boil for 20 minutes. 7.Then mix the grated pear into it and simmer it for next 15-20 mints. Keep stirring it till it leaves the sides of the pan. 8.Add the cardamom powder mix well and remove it from the stove. 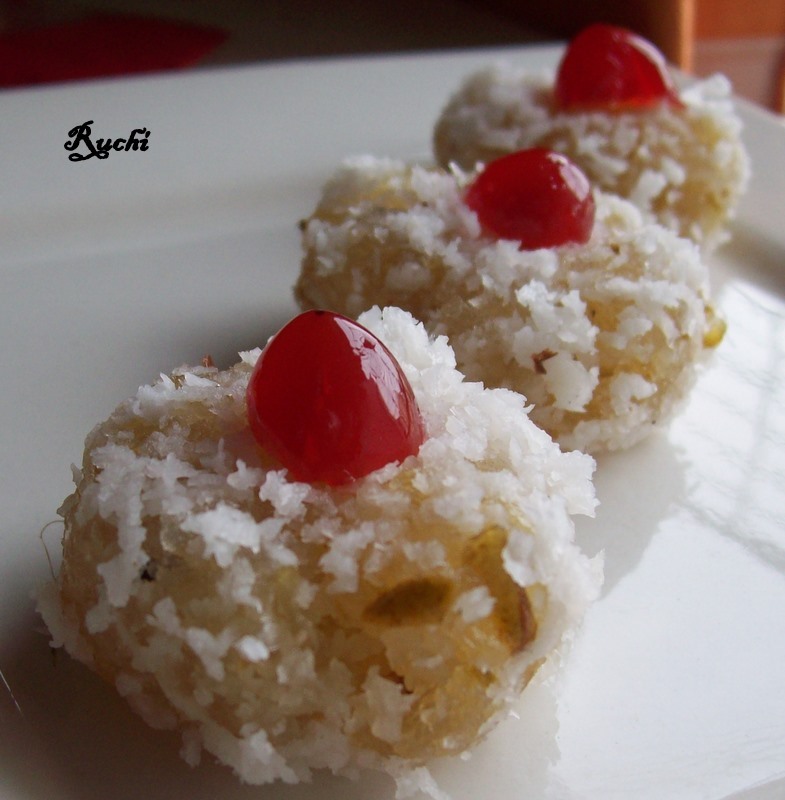 9.Make laddoos of the mixture and roll it into the rest half of coconut powder. 10.Decorate all the laddoos by putting some red cherries on top of each one. wow....laddo with pears!!! Love it already!! ooh la la - lovely ! Ladoos looks super cute Akka..